Please send Rabbainu's holy tomb to the Holy Land a.s.a.p.!!! As previously posted B"H we already have $1500 towards the publication of Sefer Hamidos, everyone is urged to help and participate, either financially or by helping translate and editing. 1. One who conducts himself with abstinence and afterwards retracts from it, falls into additional lust more than he had before his abstention. 3. Abstinence from sexual relations is reckoned as a fast. 4. The sickness of coughing up blood is due to canceling (or refraining) from the sexual relations of the night of (one's wife's) ritual immersion. This is a great story, of a child who sanctified the name of God, it happened two weeks ago in Safed, I just heard it now from a rabbi here in Meron by Rabbi Shimon Bar Yochai. A boy came late to class, so the teacher told him (in Hebrew) go bring a note - "pettek", so the boy put his hand into his pocket and extracted the holy Pettek.... The school kicked him out! The merit of the Pettek will stand by him and his children and grandchildren. Rabbi Nachman addresses modern day issues including women's lib. Recently I have been studying the 10th teaching of Likutay Moharan and although I wasn't surprised, because by Rabbainu this is common, I was astounded to see how Rabbainu addresses many of the current major issues in the media. In this teaching Rabbainu says that when there are harsh judgement in the world, the remedy to mitigate and sweeten them is to equate the woman to the man! This will probably get many women excited, but hopefully they will have the integrity to examine further what Rabbi Nachman considers equality. epilogue, it is now a week after I originally posted this, I have just learned that my friend Shimon had been incarcerated and was just freed, this is amazing because this Torah from Rabbi Nachman discusses the incarceration of Shimon! Also the aspect of Binyomin, because he was attacked by the zionists who want to take Israel, as discussed in that Torah! Last Thursday I had a strong thought, that the first book we should be doing hafatza on should be Likutay Tefilos, because that way as we give out these holy prayer book, more and more people will be praying for our success (as we find in the Story Tales, in the story of the Master of Prayer). The next day I found out, that on Thursday, B"H, our friends finished the arrangements for a mega publication of Likutay Tefilos! They plan on printing 1000 to see how it comes out, and then proceed with another 9000. What they have prepared is in the epitome of beauty, B"H. One of the Nanach children who is not attending school, proofread the work making many corrections (I think he stayed up one night doing this). B"H the mega printing of Sefer Hamidos has been done, and B"H this week the books will be bound (the Hebrew na-nach.net has a video of the big stacks awaiting binding). The original projected 1.8 shekel was not met, but whoever ordered already will still receive that price. The actual price isn't so much more, and B"H we have learned from our mistakes and in the future we will be able to pull through with even cheaper prices. This weeks parsha discusses the Pesach. There are 3 main translations of this word. 1. Pesach means to skip over, H"Y skipped over the houses of the Jews when He killed the first born of the Egyptians. 2. Pesach can be translated as having mercy. 3. Pesach can be translated as Peh-Sach the mouth relates. If one puts all these translations together, the picture of Nanach begins to form. Because the aspect of skipping is very much the aspect of music (as explained by Rabbainu), and Nanach is the new song, which is to be related over and over again with one's mouth, and this is great mercy - the aspect of Nachman. The picture is developed by taking the numerical value - gimatria - of Pesach = Nachman. The picture is completed by switching the "samech" of Pesach, to a "tuv" - a function of the permutation of letters - and then taking the gematria (with the three letters) = Na Nach Nachma Nachman MeUman. B"H this week I merited to mayfitz (spreading the light of Rabbainu) with the Nanach Hafatza Tour of Israel spearheaded by Boya (Edan from the Shomron). B"H it's good to see many of our DIBs (Dear Israeli Brothers) living a good life - beautiful houses, property, neighborhoods, natural setting..... and infinitely more important it is amazing to see how much they are thirsting for the holy words of Nanach. Even in remote Kibutzim where people warned us that we would be unwelcome, people invited us into their homes to spend time with us. A few people refused to take a book, but were enthusiastic about giving us charity, many times by the time they gave the charity they were happy to take a book as well, a mitzva draws another. In the few days I helped going door to door we probably gave out close to 100 books (mostly the Hebrew "Stories and Parables") and hundreds of "patzim" (the pamphlets "Letter from Heaven", "Truth", "Rebbe") in the middle we ran out of books, so we just gave out the pamphlets, but then a Nanach came up to help out and brought us a fresh supply of books. The books are given out for free, and only after, if the situation is propitious we ask if they can give charity. The reduced cost of the Hebrew "Storys and Parables" for the mefitzim themselves is 4 shekel, and our friends who put them out are always adding many for free. In the short period of time that we have been publishing these holy books (I think that it only in the months) I think aproximately 14,000 have been published and over 10,000 already given out. B"H there was one woman who had made aliyah from London, who was very happy to receive the nanach.net "Story Tales." The magnitude of how special this is - is beyond comprehension, hundred of people have begun to be indoctrined in the holy ways of Na Nach Nachma Nachman MeUman! You too can be a part of this amazing transformation, changing the face and attitude of Israel, bringing the holy nation of Israel to the grandeur befitting the children of God. The high officer that loved money. Continuation of conversation about R' Tzvi Rosenthal. B"H we have renewed the Nanach Music site for another year. Thanks to all the donors of Nanach.net this massive Hafatza continues. Over 1000 songs, 10 Gigabytes of Free Nanach music with over 82,000 files played or downloaded. Tonight B"H there will be a bus going from the North (and probably other place) to Yosef Hatzadik!!!! The Hebrew na-nach.net has a video posted of what I guess is some type of equivalent to american idol, where 4 judges here someone singing, and if they like it they choose the singer, and only then can they actually see him. So this guy gets his turn and begins by binding himself to Rabbainu, and proceeds to sing, and 3 out of 4 judges opt for him. Nachman MeUman - TWO times. B"H coming very soon: Trick or Feat - The Priest is the Thief! B"H this is a movie I've been working on since before Chanuka, the theme song, which was composed by Rabbainu in Uman, was already posted on nanach.net. Presently the actual film has been shot (close to 11 minutes long), I just need to put it all together B"H, do the title, credits, and set up the music. Previously on nanach.net there is an explanation from Rabbainu and the Sulam where many "miracle workers" draw their power from: http://www.nanach.net/2010/03/see-yourself-see-god-sing-na-nach.html. Amazingly this week I came across a piece from the Noam Elimelech on this weeks parsha which supplements this concept beautifully. The Noam Elimelech explains what Pharaoh says to Moshe and Aron, "make a wonder for you" which is strange because Moshe and Aron would be making the wonder to make a point to the Egyptians not for themselves (most people just read this verse as "make yourselves a wonder", but it still hints this meaning, that the wonder is to be made for them). The Noam Elimelech says that real miracles are completely new in the eyes of their makers, no matter how many times they've done them, if the miracle is true it will be a complete novel experience. Pharaoh was used to seeing magic and understood that even "holy men" could pull of tricks, so he demanded Moshe and Aron to demonstrate a true miraculous act of God - which would be a wonder even to them, to Moshe and Aron. This is exactly the concept explained previously on nanach.net, that the MSS - the charlatan leaders often pull of feats, but they pull them off from the dead power of their stagnating in "old age" of devotion. To make it very short, some of the Nanach were doing hafatza and they met a woman who was diagnosed with having a tumor in her head R"l, the woman was visiting family and took an interest in the Kumaya, the next day or a few days later (all this happened this week) the Nanach decided to check up on her at her home in Karmiel. When they got there the woman was in very fallen spirits and was immediately enlivened, the Nanach came with a guitar and singing and dancing. When things calmed down the woman gave a 200 shekel donation, 200 is the numerical value of the letter Resh. On the way out, the Nanach noticed that the mezuza was out of place, taking interest they opened it up and examined it, they found that one of the words, "asher" the letters of which can be rearranged to spell "rosh" - "head", the letter Resh was defected and looked like the letter Yud - this would provided the same letters as the word "Yeush" - "despair"! As Divine Providence had it, Gil - one of the Nanach - had a kosher mezuza in his pocket! The Nanach affixed the Kosher mezuza in the right place, and we are now extra hopeful that in the merit of Rabbainu, Na Nach Nachma Nachman MeUman that this woman will have a speedy and full recovery, amen! This weeks parsha's name is not taken from the first verse, which would offer: "Ani Hashem" "I am G-d", rather the name is taken from the beginning of the second verse, "VuAira el Avrohom..." - "And I appeared to to Abraham", so special attention should be given to the name, for why it was chosen over "I am G-d"! Examining the numercal value, gimatriah, it is found that "VuAira el Avrohom" with the words and inclusive, equals Na Nach Nachma Nachman MeUman [which is the secret of the "I", as discussed elsewhere]. Through controversy one fall to immoral acts. At times there is no peace in a persons home and his entire family if bickering with each other. It should be known that there are demons in the house that are causing all of this and through this much suffering comes to his family. One who withstands a test of Niuf will merit enormous wealth amongst his enemies. A person that does not rectify the sins of his youth (Pgam Habris) becomes depleted. When a person accidentally breaks a vessel, it is a sign that he is a sinner. Rain is prevented due to Idolatry, Niuf, for a Tzadik that was not mourned properly and fro those that invade the livelihood of others. Through immoral acts comes poverty. Sometime the punishment of death by Kares is exchanged for poverty. Through Teshuva livelihood comes easily. A person that controls his desires, his children will not follow a bad path, his money becomes blessed and he will not be subjected to tests. Traveling leads a person to Lashon Hara, idolatry, adultery and murder and these sins ruin ones livelihood. Through keeping Shabbos one draws upon himself the light of Moshiach, this also takes place through Teshuva. A person that has impure thoughts about a non jewish woman, causes his children to not be able to learn Torah. One that has a relationship with a non Jewish woman, it is considered as if he intremaried. Perfumes put lust in a person. People can not stand an old pervert and in the end he becomes humiliated in his own eyes. Seven people are considered excommunicated and one of them is a person without a wife. The Noam Elimelech says that Moshe Rabbainu did an "aveira lishmu" - a bad deed for the sake of Hashem, presenting himself as a God to Pharaoh! Moshe Rabbainu had to do this in order to lower himself into Pharaoh's paradigm in order to communicate effectively. This is amazing, often people accuse me of making Rabbainu into a God (Saba once brought this up, and without answering the accusation he continued by saying, in truth we haven't even touched the surface of Rabbainu's praises! ), until now I thought that they were just transposing their own fault (these people constrict God to their own conceptions) on me. According to this Noam Elimelech it could very well be that Rabbainu intentionally gives this impression over to people in order to lower himself into their mindset so that he can begin to rectify them. Is one allowed to play? A Rav was once asked if it is permissible to play basketball on the holy Shabbath. The Rav asked them what soccer was, so they explained to him that people try to put a ball in a net. So the Rabbi said, if that's the case, what's the problem, they could put the ball in the net before Shabbath! When many people talk against a person, the Yetzer Hara gains the power to strengthen himself on the person being spoken upon and one has to ask Hashem for mercy to be saved from this. A person that convinces and misguides his friend from the path of good will not be able to stand against his enemies during a time of fighting and war. New English Nanach Books - FREE!!!! B"H the new Story Tales came out amazing, and the first 1000 copies have basically been distributed already, the other 2000 I think should be coming out of the press right now. B"H right now we are working on fixing up all the many typos and whatever mistakes there are from this awesome book. B"H right now we are working on putting out The Book of Traits, we have already received $1500 towards the publication. Nanach on TV - Top Israeli Video of the Year 2011!!! obviously this site and video has alot of immodesty and viewer discretion is required. Introduced as, 'as can be expected/understood a Breslov Chusid that... true happiness' the hosts are laughing and say that they have to see it again, it is shown again, and then the hosts are left ogling and speechless. This weeks Parsha is called Shimos, 'names', and that really highlights the importance of names, particularly the names of tzadikim. From there we can understand a little the supreme importance of the name of the head tzadik, Na Nach Nachma Nachman MeUman. Rabbainu revealed in Likutay Moharan (A Collection of the Teachings of Rabbi Nachman Vol. 2, Torah 73) That the last letters of the first words of the parsha - ואלה שמות בני ישראל הבאים מצרימה את יעקב איש וביתו [And these are the names of the Children of Israel that are coming to Egypt with Yakov a man and his household] spell out two words: תהלים תשובה - 'psalms' 'repentance'. Rabbi Nachman explains that the names of the twelve tribes - Shivtay Y"H (the tribes of Y"H) - are compromised of 49 letters, which signifies that there 49 gates, and each gate parallels a level of repentance (i.e. drawing close to H"Y). There is a 50th level which is so to speak the repentance of H"Y Himself. Rabbi Nachman revealed that often when people want to repent and draw close to H"Y they do not find their gate, and even if they do find their gate it is locked, and this is the power of the psalms, for King David embedded in his Psalms the key to all 50 gates. So if a person wants to find his gate to repentance and traverse, Psalms are critical. If we take the first letters of these words (skipping the letter/word 'and') we get: אשביהמאי- this is the acronym of "Yisroel Ber (Saba Yisroel who received the Petek) - Isaac Shlomo (Saba's father) - Esther Mindel (Saba's wife) - Y"H"!!!! This Shabos by the Western Wall I was telling all the visitors Nanach, and I overheard a secular Jew telling his family that he had seen this on TV, which got them a little excited and they turned around to get another look. When did Rabbi Nachman begin Na Nach Nachma Nachman MeUman? This is a question I discuss in my book Likutay Nanach (available for free download at nanach.org). This Shabos I was graced by the startling revelation that the numerical value (gimatria) for Na Nach Nachma Nachman MeUman, when using the full value of the final Nun - 700, is 1791. In 1791 Rabbainu was aproximately 18 years old! And in the tenth year following, Rabbainu (apr. 27) visited Rabbi Shimon Bar Yochai in Meron, and Rabbi Shimon asked him, Meron, Me Ron? - who is singing, and Rabbi Nachman revealed to Rabbi Shimon that it was he! The end of this weeks parsha, which is also the end of the first of the five books of the Torah, tells how Yosef has his brothers take an oath that they will bring his body to the Holy Land (in last weeks parsha, before Yaakov went down to Egypt, H"Y guaranteed him that he would be buried in Israel). Yosef tells them that H"Y will remember them - "pukoad yifkoad". The word "pukoad" has the gimatria (numerical value) of 184, which is the gimatria of the Divine Name of 72 (the Tetragram spelled out with yuds: YVD HY VYV HY) in the format of 'achoraim' (i.e. in the same fashion as Na Nach Nachma Nachman MeUman - YVD, YVD HY, YVD HY VYV, YVD HY VYV HY). [Our sages say (see Rashi parshas Shimos 3:18) that Yosef actually told that the brothers that this was the code that the redeemer would express.] It therefor makes sense that after the revelation of the Petek and particularly Na Nach Nachma Nachman MeUman the time has come to bring Rabbainu to the Holy Land, as he desired and expressed explicitly (quoted in The Life of Rabbi Nachman). bs"d In honor of Rabi Natan's hilula today, yismach libi veyagel kevodi to publish for the first time the following Torah in English. In this merit may we merit to beard and pe'ot and all the sodot in them, the attainment of Torah and perception of Godliness and hamtakat dinim and so forth. The prohibition of shaving the peyot and the beard [zakan, same root as zaken/old/elder], according to what is written in the essay Meishra DeSakina/Bed of Knives in Likutei Moharan #30, that a person's hairs correspond to Chokhmah Tata`ah/the Lower Wisdom, which is the essence of perception [of the Torah] which corresponds to Malkhut/Kingship; see there. And it is necessary to draw life unto it. Therefore we must raise it to the Ohr HaPanim/Light of the Countenance [of God, as it were] which illuminates via three "legs" which correspond to binah-liba (understanding corresponds to the heart). And it is necessary to cut it off from the Four [Evil] Kingships which are the Sitra Achra/Other Side so that they will not feed from Chokhmah/Wisdom which corresponds to Malkhut as mentioned, which corresponds to daleit [the letter ד which can be read "de'leit," "which has not," for Malkhut has nothing of itself but only what it receives from the other Sefirot]. And this is accomplished via chesed/kindness/generosity, corresponding to Avraham. And chesed is revealed via tokhacha/rebuke/inspiration; see there. איסור גילוח הפאות והזקן ע"פ מ"ש במאמר מישרא דסכינא סי' למ"ד שהשערות הם בחי' חכמה תתאה שהוא עיקר ההשגה שהוא בחי' מלכות ע"ש.. וצריך להמשמיך לה חים. ע"כ צרייכן להעלותה אל אור הפנים המאיר בג' רגלים שהם בחי' בינה לבא. וצריך לחתכה מן הד' מלכיות שהם הס"א שלא יהי' להם יניק' מן החכמה בחי' מלכות כנ"ל שהוא בחי' דלית וזה נעשה ע"י חסד בחי' אברהם והחסד נתגלה על ידי התוכחה עיין שם. And behold, the peyot and the beard are the Ohr HaPanim/Light of the Face, Hadrat Panim/honoring the face, corresponding to attainment of wisdom, as is written, "Vehadarta penei zaken/And you shall give glory to the face of the elder," since the beard is the glorification of the face, Ohr Hapanim, which corresponds to Wisdom, as is written, "Chokhmat adam ta'ir panav/The wisdom of a man illuminates his face." For the beard corresponds to the Thirteen Midot [Dimensions] of Torah Exposition, as all this is brought in the words of Rabbeinu, see there, that they are the root of attaining wisdom. And therefore the beard and the peyot are hairs, because they correspond to perception of wisdom, since the essence of perception corresponds to hairs, which are Lower Wisdom, as written. And this is the aspect of the Thirteen Midot which correspond to the beard, as mentioned, that is, the aspect of measure and constriction for the Upper Intellect, as written there, which is the aspect of hair, aspect of shi`ura d'atvun d'oraita/dimensions of the letters of the Torah, which are aspect of midot. And therefore it is forbidden for pass a razor upon the beard and peyot because there [in them] is the root of life and length of days, which corresponds to the beard, as mentioned, and it is injust to wave a life-shortening object upon a life-lengthening one, as Chazal said regarding the altar. And therefore it is forbidden to cut and destroy them, for on the contrary, in them is the root of the ascents of the Lower Wisdom, for they are the Light of the Countenance as mentioned. And this is the two peyot and beard corresponding to three legs which are the Light of the Countenance as mentioned. For the two peyot are aspect of left and right and the beard is in the middle which is aspect of three legs which correspond to the Three Pariarchs who are right, left and center. And the main point of the Light of the Countenance is the beard, and it is the main point of attainment of wisdom. And by means of the two peyot which are aspect of right and left, which correspond to kindness and rebuke, for kindness is right and rebuke corresponds to stringencies, aspect of the left, through this we merit to the aspect of beard, aspect of the Light of the Countenance as mentioned and as written there. But the rest of the hairs even though they too correspond to the waste products of the brain, despite this because they are in the aspect of waste products, there is feeding of the Sitra Achra from them, for that is where they feed from mainly. And therefore when they grow long it is necessary to cut them, in the aspect of "cut him in four" [I Sam. 15:33 and Rashi there], in order to not give them sustenance from the Lower Wisdom which corresponds to dalet as mentioned. And therefore it is a big mitzvah to take a haircut on the eve of a Festival in order to cut it off from the Four Kingships, so that you can go up [to Yerushalayim] on the Three Festivals which are the Light of the Countenance as mentioned. According to the essay "U'vyom habikurim/And on the day of the firstfruits -- ve'et ha`oravim tziviti lekhalkelekha/I have commanded the ravens to feed you" in Likutei Moharan II #4; take a good look there. For we need to make a vessel and channel to receive the chesed/kindness, and this is accomplished by yir'ah/awe [of God]. And awe is accomplished by ratzon/[holy] desire. And desire is accomplished mainly be connecting to the root of desire which corresponds to metzach haratzon/"the forehead of the [holy] desire." And opposite this there is the aspect of the metzach hanachash/"the forehead of the serpent" which is the opposite of the desire. And the metzach hanachash feeds mainly from the elders of the generation who are not complete, for they do not add holiness and knowledge to their days the whole time that they grow older, etc., see there. But tzedakah/charity alleviates this; see there. And this aspect of "shortness of days, full of anger" that is from the blemish of the beards/elders [zekenim] which is aspect of shortness of days -- from this feeds the metzach hanachash which is the aspect of anger, opposite of desire. But via the beard/elder of holiness we merit to desire, aspect of "zaken venaso-panim/the elder and the man of rank (lit. raised face)" (Isa. 9:14); panim/face corresponds to desire; take a good look there. 1. And therefore the Torah warned us to not destroy the the corners of the beard (peyot hazaken), God forbid. And the prohibition is mainly with a razor specifically. Because the hairs of the beard correspond the days of oldness, tangibly. For the hairs of the beard are very supernal and lofty lights which have been constricted in the aspect of hairs which are like pipes and constrictions. And this corresponds to days, for days are an aspect of constrictions and dimensions, as brought. And therefore as long as a man ages one day of his life he needs to add more holiness and knowledge each day in order to merit to illuminate light and knowledge on this day. And this is the aspect of hairs, tangibly. And therefore we need to not damage, God forbid, or destroy the corner of the beard, God forbid, in order to not blemish the aspect of the beard, to not give sustenance, God forbid, to the aspect of the metzach hanachash/Forehead of the Serpent, which feeds off of the fallenness of the days of agedness, which is tangibly the waste and falling of the beard's hairs, for the hairs of the beard are aspect of the days of agedness, as mentioned. And the main prohibition is with a razor, which is like a sword, which cuts down the days, because the sword was created to cut down the days of a man, and it is injust for it to wave over that which lengthens which is the holy beard which is aspect of length of days as mentioned. For the razor and sword are the aspect of Esav who was blessed with this, as is written, "And by your sword shall you live," and it cuts down the days of a man. For the main shortening of the days of a man God forbid is when he does not add holiness and knowledge each day of his life, as mentioned. And this happens, God forbid, via Esav who is the Samech-Mem who incites the man away from the ways of life and shortens his days thereby, God forbid, as mentioned. And therefore he was blessed with the sword, which shortens the days of a man, as our Rabbis obm explained. And by this itself that he shortens the days of a man God forbid, that is, that he restrains and incites a man from adding holiness to his days as mentioned, by this itself Esav who is aspect of the metzach hanachash gets sustenance, aspect of anger, opposite of [holy] desire, the grip of judgement. For he is aspect of `Amalek who descended from him, who is aspect of metzach hanachash, the root of the naturalistic sophistry, the grip of the overcoming of heresy. For the root of apostasy and heresy is the aspect of Amalek, as brought in the words of Rabbeinu z"l. Hence Esav-Amalek is aspect of shortness of days, filled with anger, for he is aspect of the sword, aspect of the sword of the samekh-mem, who shortens days physically and spiritually, as mentioned. And by this itself he feeds, being aspect of anger, aspect of metzach hanachash, the root of naturalistic sophistry, the opposite of holy will, God forbid. And therefore the prohibition of destroying the beard is mainly with the razor which is like a sword, for it is only justice to not wave the [life-]shortening thing upon the lengthening thing. Because the main prohibition of destroying the beard is in order to not give God forbid sustenance to the metzach hanachash from blemish of the falling of the days of elderness which corresponds to destroying the hairs of the beard as mentioned. And therefore the main prohibition is with a razor or sword for by this a person blemishes very, very much, God spare us. For he destroys the holy beard via a razor or sword and gives, God forbid, sustenance to the razor or sword which is the aspect of Esav, aspect of metzach hanachash from the falling of the hairs of the beard God forbid. And therefore the main prohibition is with a razor, for this is the main blemish, to not give sustenance God forbid to the aspect of razor or sword which is the aspect of anger, aspect of metzach hanachash from the falling of the hairs of the beard as mentioned. 2. And by this is the made clear and revealed to the eye of an intelligent person that it is because of this that the sophistry of philosophy and heresy overcame exceedingly in the lands of Germany and their likes, for due to our many sins they were taken captive in the homelands of the Accuser and became widely accustomed in this great sin of destroying the corners of the beard. And in truth according to the [kabbalistic] writings and books of holiness, even destruction by other methods permitted by law is also a very, very tremendous blemish, God spare us; the Merciful One save us from that punishment. For all the hairs of the beard are very supernal and lofty and awesome pipes, and there is no one who can conceive and grasp in his mind the astounding loftiness of the holiness of the holy beard, and vice-versa it is unfathomable, God spare us, the punishment of one who destroys and raises his hand and spoils such a lofty holiness. But due to our many sins, over the length of time many of them have broken through the fence, and they transgress five negative commandments boldly and they destroy the beard with an actual razor. Woe for their souls! For evil has been payed abundantly upon them, and by means of this the naturalistic sophistry becomes strong there. For the metzach hanachash which is the root of the naturalistic sophistry feeds from the falling of the beard, as mentioned; understand. 3. And this is the aspect of the prohibition rounding the pe'ah/corner-hairlock of the head. And the pe'ot are essentially next to the padachat which is the metzach/forehead. For the pe'ot are aspect of yir'ah/awe [of God] for pe'ah is gematria of Elokim which corresponds to yir'ah as it says, "et ha'Elohim yir'a/fear God" (Eccl. 12:13), and the root of yir'ah is by way of the desire, as mentioned. And therefore we let the pe'ot grow next to the forehead because from the aspect of the forehead of the desire, which is the root of the desire, issues forth awe which is the aspect of pe'ot as mentioned. But in order that God forbid the metzach hanachash, which is the root of the naturalistic sophistry, not overcome, which picks up a blemish and apostasy even at the root of the desire, at the metzach haratzon as mentioned, therefore we need to let the corner of the beard grow and not destroy it God forbid in order that the metzach hanachash not overcome, God forbid, as mentioned. But via the holy beard the revelation of the desire overcomes, for the metzach hanachash is suppressed and the metzach haratzon overcomes, the root of the ratzon and then we merit to awe which are the pe'ot that are next to the forehead as mentioned. And this is the aspect of the prohibition of shaving the pe'ot and the beard, which are one from one concept, for they are interdependent, as metnioned. And therefore the entire Judaism depends on this. For this is the main course of the Yisraelites and our main work, that we merit to reach the aspect of "ve`amedu zarim u're`u tzo'nchem/and strangers shall stand and feed your flocks" etc. (Isa. 61:5) That is, that we should not need to be involved in any business of this world, only in the service of Hashem all day. And this is impossible unless His mercy is abounds upon us, the aspect of "ve'atem kohanei Hashem tikarei'u/and you shall be called the priests of Hashem" (ibid. 6). And it is impossible to receive the kindness except through yir'ah, and the awe is accomplished by the desire, through the aspect of the forehead of the desire etc., as all this is explained in the essay mentioned above; take a good look there. And therefore the root of Judaism depends on the pe'ot and the beard, because through this the aspect of the desire is revealed, through the aspect of the beard as mentioned, aspect of the "zaken venaso-panim/ the elder/beard and the man of rank (lifted face)" as mentioned. And when we merit to awe then automatically the kindness is bestowed. For the kindness is always being bestowed abundantly, only we need a vessel and channel to receive the kindness, as explained there; see there. Hence via the beard and peyot we merit to awe and then we merit to receive the bounty of kindness and then we do not need to be involved in any business, for the world is sustained by His kindness. And then we can be involved in the service of Hashem all day. And this is our main longing of Yisrael, to reach this. And therefore the essence of Judaism depends on the beard and peyot as mentioned. See the essay "u'v'yom habikurim" mentioned above; take a good look at the whole essay. "Lo takifu pe'at roshechem, velo tashchit et pe'at ziknekha/You shall not round the corners of your head, and you shall not destroy the corners of your beard" (Lev. 19:27). According to the essay Meishra deSakina etc in Likutei Moharan #30; see the entire essay from beginning to end. 1. And this is the aspect of the prohibition of shaving the pe'ot and the beard which are hairs adjacent to the face. For the Malkhut/Kingship, the Chokhmah Tata'ah/Lower Wisdom mentioned in that essay corresponds to heairs, aspect of shi`ura de'atvun de'oraita/dimensions of the letters of the Torah, as thoroughly explained in that essay, through which hairs which are aspect of constrictions we can attain perceptions of His Blessed Divinity. And therefore it is prohibited to destroy the hairs of the beard and the pe'ot which are the hairs closest to the face. Because the main life of the Malkhut/Kingship which is the aspect of Chochmah Tata`ah/Lower Wisdom is from the Light of the Face which shines in the three Legs as mentioned. And therefore via the hairs which are close to the Light of the Face which are the pe'ot and beard, through them is drawn down the main wisdom and the constriction of the perception of His Blessed Divinity, because the main life of the Malkhut, Chochmah Tata'ah is the aspect of the hairs which is the Light of the Face as mentioned. And this is the aspect of the beard and two pe'ot corresponding to the three Legs in which the Light of the Face shines. 2. And therefore the essence of the Yisraelite religion and the root of Judaism depends on the beard and the pe'ot, and by them is a Jew recognized, "...that [he] is from the seed that Hashem has blessed" (Isa. 61:9), from the seed of Yisrael. And whoever has a "different spirit with him," God forbid, and wants to deny, God forbid, the God of Yisrael, the start of his denial is casting, God forbid, the beard and the pe'ot off of him. For in truth the whole Yisraelite religion depends on the beard and the pe'ot, for all the words of our holy Torah and all the mitzvot are all an aspect of constrictions for perceiving His Blessed Divinity, as explained in that essay. For each and every letter and word of our holy Torah, Written Torah and Oral Torah and each mitzvah and each kosher custom of Yisrael the holy and chosen people, are all dimensions and constrictions through which they merit to attain perceptions of His Blessed Divinity, each one according to what he fits in his heart, according to what he merits via his service and effort in Torah and mitzvot and good deeds, and separation from the bad. And all these constrictions and dimensions, aspect of dimensions of the letters of the Torah, they are all aspect of hairs as mentioned, and they are all drawn down from the hairs of the Holy Face [so to speak] and Its pe'ot. For each and every hair of the pe'ot and of the Holy Glorious Face are all aspects of lofty channels and holy constrictions from which all the wisdom of the Torah and the mitzvot are drawn down, through which we perceive His Blessed Divinity. For the thirteen tikunim/"states of perfection" of the Holy Beard correspond to the Thirteen Attributes of Torah exegesis which are the entirety of the holy Torah. Woe for he who touches, God forbid, to destroy one hair of the holy beard and the pe'ot with contempt in his soul and with malice and with treachery! Woe for him and woe for his soul! for he uproots himself and his soul from the God of Yisrael and has no portion in Torat Moshe! Woe for their souls for evil has been recompensed upon them! And because of that, due to our very many sins, the sophistry of philosophy and heresy has become widespread in Germany and its surroundings, for they have completely thrown the yoke of the kingship of Heaven off of them in these generations, and cast off their beards and most of the pe'ot and go dressed in the others' clothing, etc. as mentioned. For it is made clear in that essay that sometimes the Malkhut-Chokhmah Tata'ah falls among the Four [Evil] Kingships. And this is the aspect of the "shout of a ruler among fools," that the Malkhut shouts out in a bitter voice, that the Wisdom has fallen amongst the fools, that the fool wants to "be wise," that is, that they want to overcome, God forbid -- via their external wisdoms, which are the philosophy and heresy which are truthfully foolishness, by means of the Chokhmah Tata'ah having fallen -- the aspect of the Malkhut in exile, etc. And therefore when they destroy their beards in Germany, by this they blemish in the constrictions of perceptions of His Blessed Divinity mentioned above, in Lower Wisdom, in Kingship as mentioned. And therefore through this, God forbid, the outside wisdoms are strengthened, which are the wisdoms of philosophy. And therefore they are involved there in the external wisdoms exceedingly, by destroying the corners of their beards with contempt in their souls and transgressing five Torah prohibitions each time. For they are interdependent, as mentioned -- external wisdoms via destruction of the corners of the holy beard as mentioned. But in truth they do not transgress only five prohibitions. For when they destroy the corners of their beard it is as if they transgress the whole entire Torah. For the whole entire Torah depends on this, as mentioned. For via the razor and the knife that they raise upon the holy beard to destroy it, God forbid -- through this, God forbid, the kingship of `Amalek overcomes, who is the entirety of the Four [Evil] Kingdoms, as mentioned in the aforementioned essay. For Amalek is from the seed of wicked Esav, who feeds from the aspect of "ve`al charbekha tichyeh/and by your sword you shall live" (Gen. 27:40), whose main feeding is when the Lower Wisdom is blemished, the Kingship mentioned above, which is the aspect of "cherev nokemet nekam-brit/the sword that avenges the vengeance of the Covenant" (Lev. 26:25), as explained in that essay. And this is the aspect of, "Cut him in four" [I Sam. 15:33 and Rashi there] mentioned there in that essay. For the main elevation and repair of the Kingship is via repair of the holy sword through which we cut off the Malkhut which is aspect of dalet from the Four [Evil] Kingships in the aspect of "Cut him in four" and subjugate the sword of Esav who is the Kingship of `Amalek, aspect of "And by your sword you shall live," as mentioned. But when someone raises, God forbid, a razor or knife -- which is the aspect of a sword -- upon the holy beard, he blemishes very, very severely in the Kingship of Holiness, which results in the "sword that avenges the vengeance of the Covenant," the main feeding of which is from the Light of the Face, from the aspect of the hairs of the beard and the pe'ot as mentioned, and God forbid, the sword of Esav overcomes, the aspect of the Kingship of `Amalek who is the entirety of the Four Kingships. And they came to all this through blemishing the Covenant [of Abraham, i.e. they cast away circumcision, family purity (taharat hamishpachah), etc.] first, for surely no man raises his hand to destroy the corner of his beard, God forbid, unless he first blemishes the holy Covenant exceedingly much, through which he blemishes in the brain, in the Lower Wisdom mentioned, and evil thoughts carry on inside him, external wisdoms, until the evil spirit beguiles him to destroy his beard, God forbid, through which he uproots himself completely from the Kingship of Holiness, from Lower Wisdom, from the perception and faith of Yisrael, and has no portion in Hashem Yitbarakh and His holy Torah and in His holy people Yisrael, as mentioned. 3. But the root of the kindness, through which we sever the Kingship from the Four [Evil] Kingships as mentioned is drawn down by means of rebuke, for via rebuke, kindness is revealed. And the rebuke is according to the Torah and the prayer of each and every person, according to the boldness of each and every one, etc, as all this is well explained in that essay. And all this is included in the holy beard. For "se`arot dedikna kashishim le'achpashah ledinim/the hairs of the beard are coarse in order to subdue harsh judgements," as explained in the holy Zohar. And this is the aspect of the `azut dikedushah/holy brazenness mentioned, corresponding to `az vekasheh/bold and hard, through which is the main attainment of the Torah and prayer, which are included in the holy beard. For the entirety of the Torah that we renew is the Thirteen Attributes of Mercy as our Rabbis obm said, that HaKadosh Barukh Hu "wrapped himself" and taught Moshe the order of prayer, and then revealed to him the Thirteen Attributes of Mercy, etc. For the root of prayer is mercy and pleading, to arouse the Thirteen Attributes of His Blessed Mercy which are included in the thirteen tikunei dikna/states of perfection of the beard, as known. And by means of this, by means of the Torah and prayer which are according to the boldness of each person, the elder who sits in yeshivah knows how to lehokhiach/rebuke/inspire each and every person and open his mouth in wisdom, in the aspect of "piah potchah bechokhmah/she opens her mouth in wisdom" etc. For all the tikunei dikna surround the holy mouth, and the revelation of the channels of the holy wisdom of the beard of holiness, aspect of the elder sitting in yeshivah is revealed only through the holy mouth through which is the root of revelation of all the wisdom that is drawn down via channels of the hairs of the pe'ot and beard. And via revelation of this wisdom of rebuke, mercy is drawn down, through which we raise up the Malkhut from the exile of the four [Evil] Kingships and raise it to the Light of the Face which shines in the Three Legs. Which is aspect of "Malkhut `olah `ad hadikna kadisha/Kingships rises up to the holy beard" which is the Light of the Face. For perception of His blessed Godliness which is revelation of His holy Kingship is via many constrictions. And each and every constriction is aspect of Malkhut from a higher world and level. For the Lower Wisdom, aspect of Malkhut in the world of Atzilut is above and much higher than the Upper Wisdom that is in the world of Beriah. And when we need to raise up the Malkhut/Chokhmah Tata'ah from the exile we need to arouse and drawn down an illumination from the root of the Malkhut. That is, from the aspect of Malkhut/Chokhmah Tata'ah that is in the root the upper worlds. And by this you will understand and be enlightened a little bit of the clues in that essay. For raising the Malkhut from the four mentioned is via prayer which is the root of Malkhut as explained in another place. And therefore the main remedy of raising the Malkhut is via the holy beard which is aspect of Light of the Face. For the holy beard is also drawn from the aspect of constrictions, from the aspect of Malkhut that is in very, very high and lofty worlds, as explained in Etz Chayim, that the lights of the beard are drawn down from the two pe'ot which are aspect of Elokim, gematria of pe'ah, aspect of Malkhut as explained there. Understand this well. From what I understand, yesterday 500 copies were shipped out to L.A.
are also working on Sefer Hamidos. your work will be inculcated and see immediate fruits. Hebrew na-nach.net has a picture of his grave. About two years ago (I think) someone drew a portrait of Rabbi Nachman of Breslov claiming that Rabbainu came to him (or maybe her, don't remember) in a dream asking them to draw his semblance and make it available to the public, which this person did publicizing the picture on facebook. No one can really attest to the veracity of the portrait, however the picture is innocuous, it portrays the way a Jew should look - with beard and pehyos, and it somewhat resembles a holy "settler" the likes that are Nanach or Nanach friendly. Recently our friend Barzel, who is very active in looking after the descendants of the Baal Shem Tov, particularly of Rabbainu, has been helping a descendant (or two) that mamash resemble the newly drawn picture of Rabbainu. This does lend credence to the integrity of the drawing. B"H this Wednesday Night - Thurday is the hillula of Rabbi Nussun. On Chanuka one of my friends had the privilege of visiting Rabbi Nussun, and while reciting Psalms on the tomb, he heard Rabbi Nussun encouraging him, there are more details to this story which I don't want to get into and also I don't remember well enough, but the upshot is a message very befitting what we know about Rabbi Nussun that he would encourage people and give them strength no matter where they had fallen. One of the tricks of the Evil Inclination is to get a person to feel that he can not move, and thus feeling trapped the person easily succumbs R"L to bad things. This very feeling can and should be used for the good, and is really a door and gateway to holiness, as we know that before a person can enter the chambers of holiness he must traverse the chambers of exchange where everything is mixed up. Essentially when a person dies and his soul is freed to go up, his body is trapped 6 feet under, covered in dirt, grime, with worms and termites eating and completely consuming his body - you can't get more trapped than that. So when a person starts feeling the inclinations to give up, heeding the voices and demons persuading him that he can't move, he should turn the tables on these monsters and use this as a springboard to propel his soul up high and cling to the highest holiness. A while ago we were reporting on Matisyahu and Shyne how they were getting closer to Nanach, and then they dropped out of the radar. B"H recently they have resurfaced. Matisyahu shaved off his beard - an ailment frequently found by the Nanach, unfortunately - many of the greatest Breslovers would boast how even in their old age and on their death bed they still had a beard, from this we can see that for a real Nanach to keep his beard, may entail great trials and tribulations which not always are aced. So Matisyahu seems to have broken away from a lot of sheker and we have good reason to believe that the words of Rabbainu that he received are working their wonders (one of my friends personally gave his a Likutay Tefilos). Shyne also for a while went through a state of denial, not willing to accept the importance of going to Uman, but now B"H he has reinvited the Nanach he had been friends with to continue learning with him, B"H.
B"H the Nanach will be printing the awesome holy book - Sefer Hamidos - Book of Traits, in a mass publication which will enable us to get the price down to 1.8 shekel (about $.47)! 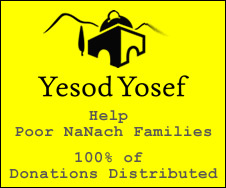 Right now we are still very short of the necessary funds, so please contribute generously, especially because the success of this project will lead to even bigger breakthroughs B"H.
In this weeks Parsha we learn how Yosef and his children were the most attached and attentive to Yaakov. Today the critical importance of the Tzadik is known to those seeking the truth, and it seems a little strange to see that the sons of the Yaakov, 11 tribes weren't more on top of this. The truth is that we find this elsewhere in the Scriptures, e.g. when King Saul (before he was king) went looking for his lost animals and his searching, a three day journey, brought him close to the Prophet Samuel he didn't consider visiting this supernal prophet, even after Saul's servant suggested it pointing out that this was a great opportunity Saul rejected it, only after the servants insistence did Saul acquiesce. From these cases we can learn that although the position of the Tzadik is critical one must still retain his own 'bechira' power of decision. The sons of Yaakov and Saul were very aware of their mission and responsibility and they were very busy doing just that, they weren't looking for a free pass to absolve themselves. However, even still, our Sages teach us that Yosef and his children are to be emulated for having clung to Yaakov first and foremost. Part of a person's position and decision making is how much he will completely abnegate himself to the tzadik - compounding his role in this world. New English Nanach Book - FREE!!! !